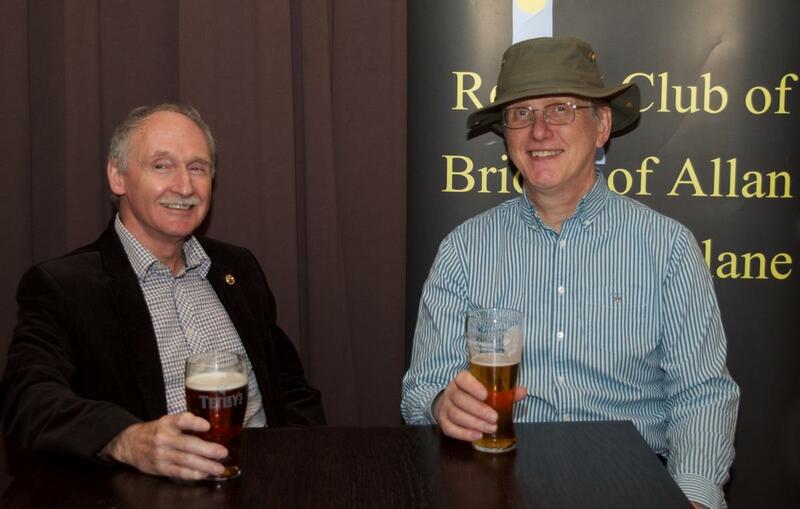 On Thursday, Rotarian Steve Bassett delivered his Face to Face to the Club. It is a tradition in Rotary that new members who have recently joined the Club are invited to give a short informal talk (a Face to Face) in which they outline their background and share some aspects of their life. Steve is no stranger to Rotary: in his earlier life he was a member of Rotaract , a Rotary-sponsored organization catering for men and women aged between 18 and 30. Indeed, it was through Rotaract that he met his future wife, Linda, who was also a member. So you could say that Rotary has been closely integrated into the family. Steve was born in Stockport, a town well-known for hat-making, hence the hat (his only hat) worn in the photograph. From schooldays, Steve was certain that he wanted to be an engineer, though he was uncertain whether a chemical or electrical engineer. In the end, fate played a part by way of BP offering sponsorships for young people wanting to become chemical engineers. Having been selected, Steve attended Bradford University, graduating with a BEng in 1984. While in employment in BP, an opportunity came up for engineers employed within the company to study control engineering. Seizing the opportunity, Steve undertook a course in Sheffield University, graduating with an MSc in control engineering. Steve now works as a control and automation engineer with INEOS in Grangemouth, dealing with technologies applied on the Forties pipeline. The job involves both resolving problems arising in that operation, and also investigating means of devising or improving systems to improve the effectiveness of the various operations: challenging, but also rewarding work. Travel has been an attraction for Steve and Linda, and they have been fortunate in having relatives living in what might be regarded as somewhat out of the way places. So they have travelled to Kathmandu, undertaking the Annapurna Trail; to Ulan Bator where they were able to experience the vastness of the Gobi Desert and travel on the trans Mongolian express; and to Suzhou, a major city in China some 100 kilometres from Shanghai. But, despite these exotic trips, they are now content to live in Dunblane, where, with access to a local allotment, Steve is able to enjoy his passion for gardening, with the cultivation of carrots being a particular challenge. In his interest in horticultural, he follows in the footsteps of Linda’s father who was a professional gardener. Jim Gardner, Speaker’s Host, thanked Steve for sharing his background in such an engaging way, and for responding so fully to members’ questions. Members endorsed these remarks in the usual way.